Rogue One doesn’t capture the Star Wars magic, but it is a skillful sci-fi action movie that possesses its own gleams of greatness. SPOILER ZONE. ABANDON HOPE, ALL YE WHO ENTER HERE. 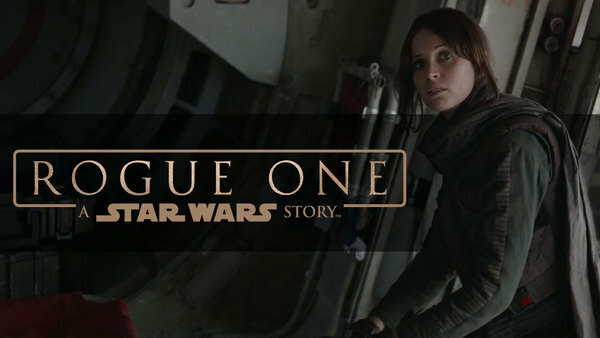 Rogue One is Disney’s first half-step beyond the traditional Star Wars trilogies. It’s a Star Wars story rather than an episode and officially outside the main arc, but it’s so closely bound to A New Hope it’s practically the prologue. If the praise is not too faint, Rogue One is the most epic prologue ever made. There is an inherent dramatic difficulty in making a movie whose end everyone knows (they get the plans), but the makers acquit themselves well. To some extent, Rogue One is Disney retconning George Lucas. But it’s a creative and convincing retcon, and it brings a level of freshness to the story. The decision to star a new cast of protagonists and a new villain created a wealth of potential because A New Hope doesn’t dictate what happens to them – and the filmmakers mine that potential to its limits. Rogue One is the first Star Wars movie without a Jedi in sight, and that creates another dramatic challenge. The makers attempt to meet the challenge with the warrior-mystic Chirrut Imwe, who succeeds in sustaining the presence of the Force in the absence of the Jedi. Although evidently not a Jedi, Chirrut exhibits Jedi-like traits – an intriguing idea that goes exactly nowhere, because the movie leaves him unexplored and unexplained. Possibly he belongs to a different Force-order. Possibly he’s a freelancer. Maybe he’s not even Force-sensitive. It’s not in the movie. If Rogue One fails to take the idea of the Force anywhere new, it does present a whole new view of the Rebel Alliance. The Alliance’s plan to assassinate the Death Star’s intellectual architect raises an intriguing moral dilemma, and if the idea is unsavory, it’s still impossible to regard the intended victim as innocent. Oddly enough, the Alliance’s assassination plot is more forgivable than its ruthless manipulation of Jyn into aiding the killing of her own father. Indeed, the portrayal of the Alliance is surprisingly dark, with little sense of higher ideals or aspirations to relieve it. Cassian, the principal Rebel character, brutally murders his own informant. The Rebels who ally with Jyn are declared to have done terrible things in their fight against the Empire. The Alliance’s leadership rejects a chance to destroy the Death Star through cowardice and sheer stupidity. The sad truth is that Rogue One goes rogue from the Rebel Alliance. Rogue One’s primary failing is that it takes too little interest in its own characters. All of them suffer some degree of neglect. Cassian is the most developed of the lot, by virtue of having a cause and experiencing inner conflict, but he’s also a joyless character, consumed by a crusade against the Empire for reasons that are only hinted at. Why the ex-Imperial pilot defected from the Empire is a mystery, as is why he volunteered for the desperate last mission. Similarly, Chirrut and his friend, what’s-his-name – you know who I mean, the one with the big gun – intervene once and then just sort of tag along for the rest of the movie. But no one is more neglected than Jyn, the main protoganist of the film. Rogue One can’t be bothered to invest in her the sort of quiet moments with which other Star Wars movies introduce their heroes – think of Luke playing with his toy ship or looking at the setting suns, or the brief shots of Rey’s handmade pilot doll and wall of marked-off days. It’s not even interested when Jyn makes decisions crucial to the plot. In the first half of the movie, Jyn disavows any interest in fighting the Empire, blames the Rebel cause for her suffering, and likens Cassian to a stormtrooper – indeed, this is the surest sign that she disapproves of the Empire: she compares Rebels to stormtroopers. And then suddenly she’s talking more Rebel than the Rebels and giving rallying speeches against the Empire. Did she believe those speeches, despite blaming the Rebels for her father’s death so shortly before? Did she believe that the Imperial flag doesn’t bother you if you don’t look up, despite being orphaned by the Imperials? Who knows? Rogue One is above all an action movie, and as it rushes from one action sequence to another, it seems hardly to care why its characters fight so long as they do. The characters are lost in the parade of explosions and firefights, and I think the meaning is, too. And then, in the climax, it’s found. It’s ironic that the film waits until the penultimate action sequence to slow down and give the characters their moments, but every second is welcome. The end of Rogue One is fantastic, leading brilliantly into A New Hope and imbuing the fight and the sacrifice with meaning. Tarkin’s final use of the Death Star offends logic, but it also gives the villain’s end a kind of horrifying justice I’ve never seen any other story achieve. No review of Rogue One would be complete without praising K-2SO and how masterfully he is used for humor, or without noting that every moment of Darth Vader’s presence is pure win. Rogue One’s frenetic pace crowds out too many quiet moments and too much thoughtfulness, and the absence of the Jedi and tarnishing of the Rebellion feel like losses. It doesn’t capture the Star Wars magic, but Rogue One is a skillful sci-fi action movie that possesses its own gleams of greatness. A good review. How it portrayed the Alliance, as both squabbling not-so-allied factions and as not really being pristine in all they say and do, was one of the more interesting parts of the story. Jyn’s change could be explained by the fact that she knows about the Death Star, knows that her father gave it a weakness, and saw how the Empire cut down the scientist working for her father. Though, yeah, the part where she’s around that meeting table trying to rally the Alliance to her side was a bit of a stretch. And it did have the best Vader scene of all the movies in it, right at the end. My impression was that we were supposed to take Jyn’s rally-the-troops speeches at face-value, but for me, it went too quickly from “You killed my father!” to “GO REBS.” I think the most rational explanation is that Jyn wanted her father’s revenge and saw the Rebel Alliance as the best vehicle for it, which makes her “rebellions are built on hope” moment rather cynical. And I don’t think that’s what the movie was going for, and I’m glad, but I didn’t see a conversion. For me, what it comes down to is that the audience can explain Jyn’s change, but we shouldn’t have to. The movie should have done that. I think it says something that after seeing the film I could not remember the name of one main character. Yes, usually that’s a giveaway of flawed character development — if you get most of your name introductions from internet websites, character posters, or other marketing. I used four names in this review, and I had to look up two of them. I didn’t even bother with the pilot (Bodi? Brodi?) and what’s-his-name, with the gun (no idea). I actually felt like the Alliance was too well put together in the film. There was no real sense of them being a desperate underground movement. They openly brought anyone to their “secret” base on Yavin 4 for meetings and apparently the chief leaders can just hang out there all the time together, as opposed to needing to keep up appearances as the senators they actually still are within the Empire? In the context of Rogue One it is baffling how the Empire hasn’t already discovered Yavin 4 and destroyed it. Don’t get me wrong, I had warm fuzzies seeing the base but I don’t want nostalgia at the expense of rational plotting. Similarly, my appreciation for Darth Vader being a boss was dimmed by the frustration of why doesn’t the rebel pass the plans through the crack before Darth Vader notices that it might be something important and just force pulls it to himself? I think it would have been more fun to have Jyn as a double agent for the Empire who turns triple agent for the rebels but hey, I’m still pleasantly satisfied with the character and basic plot. I like your point about Jyn. It’s always good to see a female lead who isn’t sexualized and who is allowed to be important for reasons other than romance. The Rebel Alliance was a writing fail in some respects. Their attitude toward the Imperial pilot and Jyn really made no sense. Why would an organization that accepts sitting Imperial senators as leaders refuse to accept an ex-Imperial pilot as a source of information? Why would any military organization dismiss defectors from the other side out of hand? Of course, they’d be skeptical – but even so, surely it’d be worth it to check into the only chance to destroy the Death Star.